Can those items be bought over here in the US? Spare a thought for all the poor military personel, who have probably been on the parade ground/line up for at least an hour before the royal personage turns up. Who had to spend hours and hours practising to be perfect, for what can be a 5 minute presentation! Not allowed to cough, scratch, move or complain. If it's hot they bake, if it's raining they drown! The unsung heroes/heroines that have had to paint the grass, search the base, been on double guard for at least 2 days before the expected visit. ...and if it doesn't move, paint it! Those were the days when I was in the Air Force. That first picture of Andrew is fabulous. Thanks once again Iceflower for the great pictures. It looks like age agrees with Prince Andrew. I agree! Thank you, Iceflower, for all the pictures of Prince Andrew. He only gets better w age! Iceflower, I can not agree with you more that Andrew is like a great bottle of wine! Thanks for ALL the GREAT pictures!!!! Will The Real Prince Andrew Please Stand Up? The Royalist - Will The Real Prince Andrew Please Stand Up? Thanks for the link, gfg02. Interesting article. I don't see the big deal that Prince Andrew posed for some fun pictures w a bunch of bathing beauties. So? It's not like he was escorting them all up to his hotel suite or something. It seems like it was just done in good fun. As for The Real Prince Andrew, I'd think it must be awfully hard for the royals to always remain formal and icy and distant. It's probably difficult for P. Andrew to balance out being a royal and being human. At least he likes to have fun. The funeral of former Russian president Boris Yeltsin will be attended by Sir John Major and the Duke of York. Former British prime minister John Major (L), former US presidents George Bush (C) and Bill Clinton (2-R) and Prince Andrew, Duke of York, attend the memorial service for former Russian president Boris Yeltsin in the Cathedral of Christ the Savior in Moscow, Russia, 25 April 2007. Another picture from the ceremony. Im glad he went He seems to be taking more Roles as the years go by . Prince Andrews visit though brief probably did a world of good for the little girl but my prayers are with her. How brave she is. May she go into a complete remission. 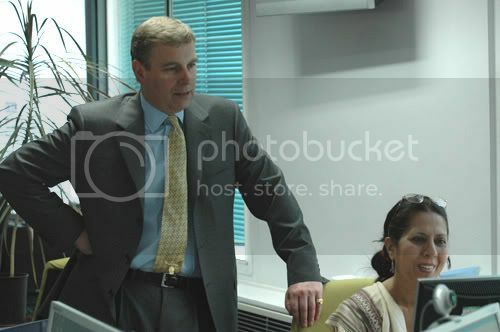 Prince Andrew seems to be a really hardworking royal, busy the whole time ,or is it my imagination? I just read in hellomag that Prince Andrew sold his home in sunninghall park, does anyone know to whom and for how much?